Recently my agent called and said he had a series of books that take place in a post-holocaust, deserted cityscape kind of like the Will Smith fiasco, "I am Legend". I loved the look of city set in that film, all unkept, overgrown and decayed and deserted. Very cool. I was excited (and a little daunted) to try and replicate that look in Photoshop. The image that was decided on for one of the covers was an aged and decayed deserted freeway with a broken overpasses and abandoned, burned out cars with weeds and vines growing all over the place. The ideal would have been to shut down the freeway and park cars in an escape route fashion and shoot the image to my liking. Alas, book cover budgets are not movie budgets, so I had to improvise. 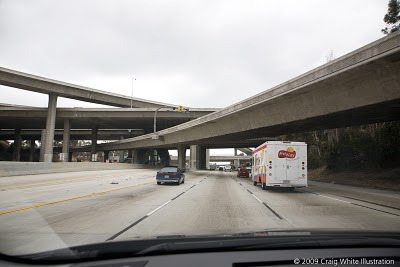 Armed with my trusty Canon 5d and my SUV, I took to the freeways of Los Angeles in search of open road and a sprinkling of cars -- a tall order in this congested city. Traffic was quite light that afternoon (wee! ), lady luck was on my side. Precariously driving up and down the 105, mostly at speeds over the limit, with one hand on the wheel and the other rapid firing my camera, I managed to take about 300 photos through the windshield of my car. I was fortunate to have a bright overcast sky as a light source so I avoided dreaded motion blur which would have ruined the details of the different elements. I used a medium/high ISO and high shutter speed to freeze the cars, pavement and signs in front of me going 70+ mph. 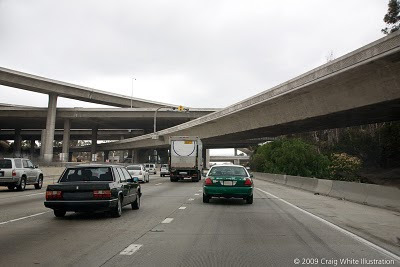 IMAGE: These overpasses were just right. IMAGE: These cars were in the right positions. 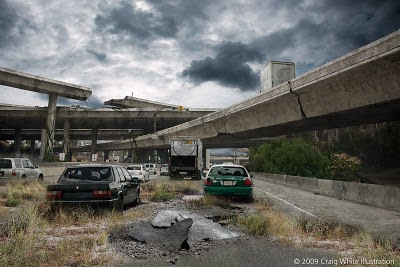 IMAGE: Overpass image and cars combined. I ended up using 3 or 4 different photos to compile the final image in Photoshop. 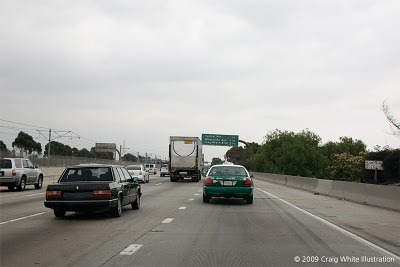 I dropped out the sky in my main freeway image then used a different image for the cars in front of me as well as some empty freeway to eliminate my vehicles front end. I painted in the vines and used stock images of grass, broken concrete and asphalt from my library. By painting with the paintbrush tool, I "broke" the windows of the cars, flattened the tires, broke the overpasses. I then added grime layers to dull and "age" the elements. I topped it off with a spooky sky from my library. The client was happy with the final image and didn't make many changes, thank goodness, because it was a huge time sucker. It didn't look like it, but it was a ton of work to create all the damage. I managed to finish the other covers in the series, but this one came out the best I think.